Before the holiday season, there is what has come to be known as the “Flu season.” Over the last few years, Americans of all ages have been told to run and not walk to get their annual flu shot. While there is no question that the flu is a substantial health risk, many, many questions have arisen in regards to the flu shot. Recently, study after study is coming out revealing serious concerns over the safety of these flu vaccinations, the lack of any long term safety studies, and whether or not these shots are even helpful at all. Although they may look innocent, flu shots can contain any variety of toxic substances that are dangerous at any dose. In fact, while malls, supermarkets, drug stores, businesses, radio station campaigns, and even places catering to children are promoting flu shots for P.R. or as a publicity stunt, fewer and fewer doctors are advocating them, and even less are getting the shots themselves. Here is what you should know. Flu shots can contain anything from aluminum, formaldehyde, microorganisms, thimerosal (mercury), ethylene glycol, and other toxic substances that are dangerous at any dose and deadly if at high doses. In addition to these substances, the flu vaccine is prepared from the fluids of chicken embryos inoculated with the specific type (s) of influenza virus that supposedly protects against the strains believed to be the most likely to be prevalent during that particular flu season. Reports over the last few years, however, have uncovered that the strains in the vaccine are typically not the strains present for that season. Not very encouraging considering the potential health dangers you are opening yourself and children to from these toxic chemicals. The flu can be deadly. In fact, building and maintaining immunity to unwanted infection, flu, cancer, and other infectious disease is always a critical matter in all seasons. Yet, the human body can not build healthy immunity by being exposed to neurotoxic poisons like mercury, aluminum, formaldehyde, and DNA from animals. Mercury is the second most toxic material on earth after radioactive plutonium. To make thimerosal, you start with elemental mercury and then ramp it up 1,000 times when you convert it to ethyl mercury. Aluminum is then added to the vaccine which has a multiplying effect on the mercury. This causes the mercury to be 10,000 times more toxic than elemental mercury. Formaldehyde is classified as a toxic, colorless, water-soluble gas having a suffocating odor known mostly as embalming fluid. It is used in vaccines as a disinfectant and preservative. There are no long-term safety studies that vaccine manufacturers can draw from to validate the effectiveness of the flu shot. In fact, a leading immuno-geneticist showed that if an individual has had five consecutive flu shots between 1970-1980 (the years studies) his/her chances of getting Alzheimer’s disease is ten times higher than if they had one, two, or no shots. The cause of this is thought to be the gradual build up of mercury and aluminum in the brain causing cognitive dysfunction (brain damage). A recent report points out that potential confusion between respiratory infections caused by influenza viruses and those caused by non-influenza viruses can result in misdiagnosis and gross overestimation of the true impact of influenza on death and illness in a given influenza season. Therefore, the scare that has been created about the flu has been exaggerated to some degree. The flu shot, once marketed to the elderly and those with weakened immunity only, is now being recommended for all. Looking at the research and using common sense regarding health, the only conclusion one can draw is that there simply was not enough money to be made by selling to this select market. Is it right for your kids? Oct. 31, 2006 – An independent analysis by the internationally renowned Cochrane Collaboration of worldwide influenza vaccine studies, published in the British Medical Journal on October 28, concluded there is little scientific proof that flu vaccine is safe and effective for children and adults. 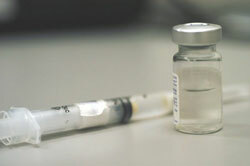 Citing the Cochrane Collaboration finding as well as methodological flaws in a child influenza vaccine study published October 25 in the Journal of the American Medical Association (JAMA), the National Vaccine Information Center is calling on the Centers for Disease Control (CDC) to stop recommending annual flu shots for all infants and children until methodologically sound studies are conducted. “There is a big gap between policies promoting annual influenza vaccinations for most children and adults and supporting scientific evidence,” said epidemiologist Tom Jefferson, Cochrane Vaccines Field, Rome, Italy, who coordinated the comprehensive analysis for the prestigious Cochrane Collaboration. Does it Work on Anyone? The Cochrane Collaboration analysis also concluded that there is no real evidence that the use of inactivated influenza vaccine has any real effect on preventing influenza. This was backed up in the prestigious medical journal, The Lancet, which stated that the flu vaccine is effective as little as 30% of the time. Additional reasoning for flu shot hazards and their ineffectiveness is that vaccines bypass the natural defensive capabilities of the liver, kidneys, colon, lymphatic system, and the immune system and deliver toxic waste directly into the body. Your body does not know what to do with mercury, aluminum, formaldehyde, chicken embryos, and microorganisms when they are dropped right into the blood stream. Guillain-Barré, autism, temporary Multiple Sclerosis-like illness, breathing problems, hoarseness, wheezing, hives, paleness, dizziness, weakness, rapid heartbeat, and death have all been reported as side effects from the flu shot. Not to mention that many people who receive the flu shot immediately get the flu. This short article is not designed to give you medical advice on whether or not to get a flu shot. After consulting your doctor about your risks, there are many very effective, natural ways to keep your immune system healthy and help boost it, if necessary, to keep you well during flu season – without needing to inject neurotoxic poisons and contaminants into your body. Your immune system is the only thing that prevents you from being overcome by infection and a host of other chronic illnesses. Therefore, supporting and enhancing it – not manipulating it – is extremely important. Helping the immune system means you do not just boost one or two components. There are 22 different instruments or components to the immune system including T-cells, B-cells, Natural Killer cells (NK cells), macrophages, lymphocytes, leukocytes, monocytes, interferon, gamma globulin, interleukin 1,2,3,4, and other white blood cells. All components must be orchestrated properly and simultaneously like an orchestra, in order to encourage optimum immunity. By definition, you can not build immunity and shield the immune system with vaccines and poisonous pharmaceutical drugs. You can only help immune system function through a healthy lifestyle that supports immune function. Eating right by obtaining adequate nutrients from your diet without over-toxifying yourself from your diet. Exercising: Although tough to acquire in today’s sedentary world, some level of physical activity is necessary on a daily basis. Getting adequate sleep: The average American gets 365 hours too little sleep per year. Addressing stressors that affect your spine, mind, and muscles. “Terry Rondberg, president of the World Chiropractic Alliance, explains that the spine does play a role in wellbeing. He notes that many factors affect the body’s ability to maintain optimal balance. Nutrition, posture, exercise, stress, fatigue are important, but so is the health of your spine. Chiropractic care was first linked to improved immunity during the deadly flu epidemic of 1917 and 1918. The funny thing was: Chiropractic patients fared better than the general population. This observation spurred a study of the field. The data reported that flu victims under chiropractic care had an estimated .25 percent death rate, a lot less than the normal rate of 5 percent among flu victims who did not receive chiropractic care. All of these factors help to keep your immune system strong and functioning how it is naturally supposed to. Eating a junk food diet, leading a sedentary lifestyle, and burdening yourself with little sleep and unresolved physical and emotional stress will only serve to bring your immune system down, where it will be of little protection. Our patients take a pro-active role in their life and health. Medical science has its benefits, but nothing benefits you like taking good care of yourself. O’Shea, Tim, The Sanctity Of Human Blood: Vaccination Is Not Immunization, eighth edition, pages 40, 41, 90, 91, Two Trees, San Jose, CA, 2004.